Finance is widely seen as an obstacle to a better world. Principles of Sustainable Finance explains how the financial sector can be mobilized to counter this. Using finance as a means to achieve social goals we can divert the planet and its economy from its current path to a world that is sustainable for all.Written for undergraduate, graduate, and executive students of finance, economics, business, and sustainability, this textbook combines theory, empirical data, and policy to explain the sustainability challenges for corporate investment. It shows how finance can steer funding to certain companies and projects without sacrificing return and thus speed up the transition to a sustainable economy. It analyses the Sustainable Development Goals as a strategy for a better world and provides evidencethat environmental, social, and governance factors matter, explaining in detail how to incorporate these factors in the corporate and financial sectors.Tailored for students, Principles of Sustainable Finance starts each chapter with an overview and learning objectives to support study. It includes suggestions for further reading, lists and definitions of key concepts, and extensive uses of figures, boxes, and tables to enhance educational goals and clarify concepts.Principles of Sustainable Finance is also supported by an online resource that includes teaching materials and cases. 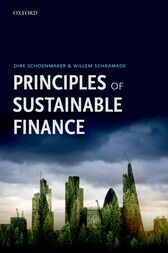 With this work, Schoenmaker and Schramade make an invaluable contribution to the role of finance in the transition of the global economy to a low carbon growth path. It should be required reading in the C-suite of any bank grappling with what climate change means for its lending strategy. Dirk Schoenmaker is a Professor of Banking and Finance at the Rotterdam School of Management, Erasmus University. He is also academic director of the Erasmus Platform for Sustainable Value Creation, a Fellow at the Brussels-based think tank Bruegel and a Research Fellow at the CEPR. Before joining RSM, Dirk was Dean of the Duisenberg School of Finance and worked at the Dutch Ministry of Finance and the Bank of England. Prof Schoenmaker is author of Governance ofInternational Banking: The Financial Trilemma (Oxford University Press, 2013) and co-author of Financial Markets and Institutions: A European Perspective (Cambridge University Press, fourth edition 2019).Willem Schramade is Senior Portfolio Manager Impact Investing and Sustainable Equities at NN Investment Partners and Guest Lecturer at the Rotterdam School of Management, Erasmus University. He manages the listed equity impact fund at NN Investment Partners, one of the first of its kind. He has been involved in sustainable investing since 2009 and has previous worked at Robeco, PwC, and General Electric.